Web-based asset management solution ManageEngine helps users track and handle the entire life cycle of their network assets. It employs numerous tools in in discovering each and every asset in a network, while being able to manage software and hardware, purchase orders, contracts and software license compliance, among many others. 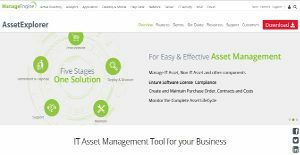 ManageEngine Asset Explorer makes managing software and hardware assets quick and simple, helping users ensure that their software licenses are compliant. The platform also enables them to follow purchase orders and contracts, to manage the complete IT Asset life cycle, and more. AssetExplorer is very easy to install, and works right out of the box. With Asset Explorer, businesses can easily come to informed decisions regarding hardware and software purchases throughout the entire IT Life Cycle. They also become well aware of the total cost of ownership of an asset. ManageEngine AssetExplorer offers businesses IT Asset Inventory Management functionalities, enabling users to stay on top of their asset inventory by keeping all information updated via periodical scanning of the software, hardware & other ownership information. Users can also follow and manage any workstation or network devices, including desktops, laptops, routers, switches, AIX machines, and more. The system also comes with a Software License Management feature that helps users comprehend and adhere to software license compliance as well as impede illegal usage and problems associated with it. AssetExplorer manages all types of licenses, including OEM, concurrent, enterprise, free, named user, node locked, and more. It also offers Software Asset Management tool that scans the organization’s network and automatically finds all software available in each workstation. Asset Managers painlessly ensure compliance by documenting all instances of complaints, under licensed and over licensed software. With ManageEngine AssetExplorer, Purchase Order Management is a breeze. The system automatically determines areas that require reduction in spending, policy enforcement, as well as the elimination of redundancies. AssetExplorer also helps in managing the complete lifecycle of a Purchase order and simplifies significantly the handling of the complete life cycle of an asset from procurement to disposal, as well as managing each and every asset that are to be acquired via purchase order management. From there on, it follows the whole hardware and software inventory of these assets. AssetExplorer scours and audits all workstations found across your enterprise network, whether connected by LAN, WAN, and VPN. It delivers complete ownership information regarding the asset along with the hardware and software inventory details, providing users with a a clear picture of who owns what. If you are interested in ManageEngine AssetExplorer it could also be beneficial to investigate other subcategories of Best IT Asset Management Software collected in our base of B2B software reviews. It's important to realize that virtually no service in the IT Asset Management Software category is a perfect solution that can meet all the needs of different company types, sizes and industries. It may be a good idea to read a few ManageEngine AssetExplorer reviews first as specific software can perform well just in a really narrow group of applications or be created with a really specific industry in mind. Others can function with a goal of being simple and intuitive and as a result lack complicated features desired by more experienced users. You can also find software that cater to a wide group of users and give you a rich feature set, however that frequently comes at a more expensive price of such a service. Be certain that you're aware of your requirements so that you pick a software that offers specifically the elements you search for. How Much Does ManageEngine AssetExplorer Cost? We realize that when you make a decision to buy IT Asset Management Software it’s important not only to see how experts evaluate it in their reviews, but also to find out if the real people and companies that buy it are actually satisfied with the product. That’s why we’ve created our behavior-based Customer Satisfaction Algorithm™ that gathers customer reviews, comments and ManageEngine AssetExplorer reviews across a wide range of social media sites. The data is then presented in an easy to digest form showing how many people had positive and negative experience with ManageEngine AssetExplorer. With that information at hand you should be equipped to make an informed buying decision that you won’t regret. What are ManageEngine AssetExplorer pricing details? What integrations are available for ManageEngine AssetExplorer? If you need more information about ManageEngine AssetExplorer or you simply have a question let us know what you need and we’ll forward your request directly to the vendor.